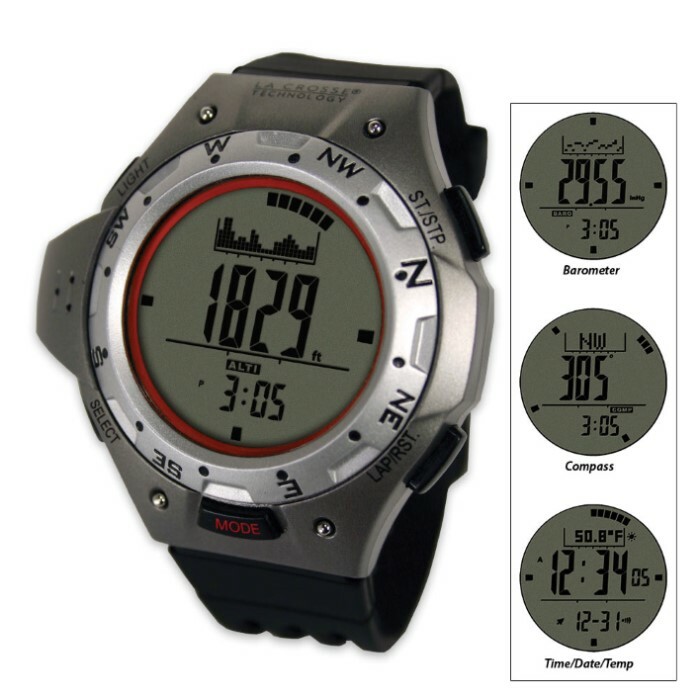 La Crosse XG-55 Digital Watch with Altimeter / Compass / Barometer | BUDK.com - Knives & Swords At The Lowest Prices! The XG-55 Digital Watch from La Crosse Technology tackles the jobs of numerous outdoor instruments, effectively replacing them with a compact (typical watch size), wrist-worn apparatus that's always at the ready and never out of reach! Featuring multiple modes, dozens of useful features and countless personalized options, the XG-55 is an altimeter, barometer, compass, stopwatch, weather forecaster and advanced watch all in one intuitive, user friendly device. It's made from cutting edge metals and polymers and is water resistant up 30' - more than capable of standing up to harsh outdoor conditions. The backlit display lets you use the XG-55 in the inky blackness brought on by nights in the woods, and a single 3V CR2032 lithium battery (not included( keeps all its features running for months without a hiccup. Best of all, the XG-55 is just plain fun to use! 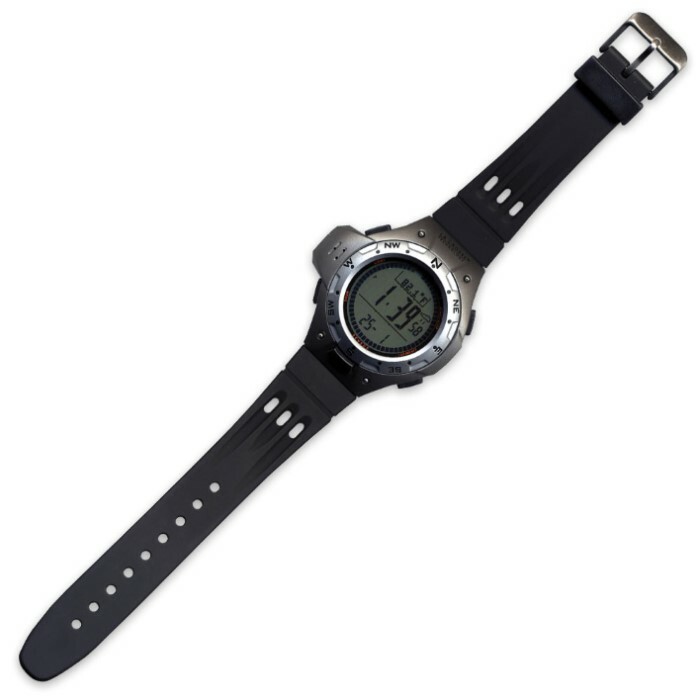 Try La Crosse's XG-55 Digital Watch once, and you'll wonder how you ever survived a wilderness excursion without it! Altimeter Mode: Features 23-hour altitude history graph with X and Y axis view; four adjustment methods - zero altitude, absolute altitude, sea level pressure and factory default; range: -2306' to 30,065'. Barometer Mode: 23-hour pressure history graph with X and Y axis view; history recall; fine calibration; range: 8.85" Hg to 32.48" Hg. Compass Mode: 16 compass directions (0° to 359°, digital); 16 bearing directions (1 to 60 pointers, graphical); digital bearing reading lock; digital backward bearing. Chronograph Mode: 100-lap memory; recall lap history and total time. CURRENT TIME MODE: current time - hour, minute, second display; 12 or 24 hour time display; calendar (month, date); hourly chime; two daily alarms; dual time mode. Other Features: current temperature; forecast icon; countdown timer; low battery indicator; LED backlight; water resistant case; low battery indicator.